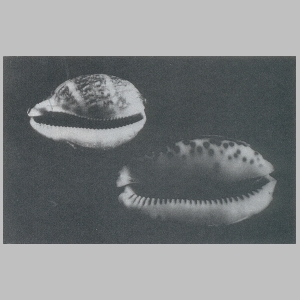 Cowries are well known and popular with shell collectors. The shells are unusually beautiful because of their rich colours and high polish. 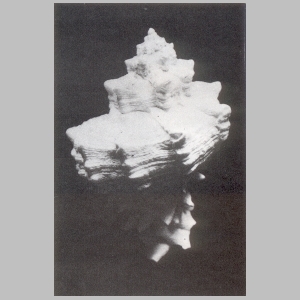 Although generally smooth, some groups are ribbed or pustulose, but even they have the characteristic porcelain-like glaze which is secreted by the mantle covering the shell when the animal is crawling. The snail-like animals which inhabit the shells are often as colourful as the shells themselves, sometimes in brilliant shades of orange, red or blue-black. The mantles, in addition to this bright coloration, are usually heavily ornamented with single or branched filaments which may be yet another colour. The pigment of the mantle seems to have no relationship with the colour of the shell. The animals are slow-moving creatures that feed on algae, coral, sponges, foraminifers and small crustacea. They live on rocky bottoms in warm, shallow waters, although some come from depths around 200 meters. By day they are secretive, hiding beneath rocks and in crevices, but at night they can be found wandering on rocks, coral or open sand. 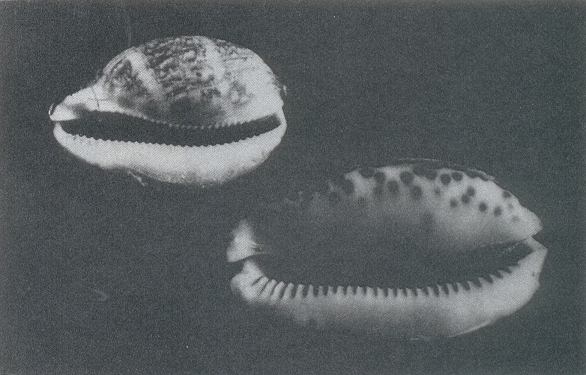 Cowries are unusual in that they breed spasmodically, but generally in warmer months. The female lays a mass of eggs on rock or dead coral and then broods or sits over them for one to two weeks until they hatch into the free-swimming larval stage. The young animal settles and progresses to the bulla stage with a colourless, paper-thin, transparent shell in a shape very like a bubble shell. As the shell increases in size and thickness, the edges of the aperture come together until the opening is only a slit. As the shell thickens, the pattern, with its polish, is laid on by the mantle, and where the thin lobes of the mantle come together on the back of the shell, a dorsal line can usually be seen on the adult shell. Archaelogical teams working in the Emirates have listed some cowries among their artefacts such as those on display at Al Ain and Dubai Museums. Meleiha, a Hellenstic site dated to around 180 BC, is in Sharjah Emirate south of Al Dhaid. 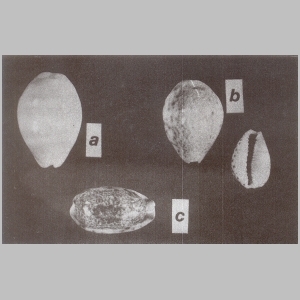 Here four charred or blackened money cowries (Monetaria moneta) and one larger worn cowry (probably Erosaria turdus) were found along with coins and beads in what may have been a tomb. In numerous primitive graves in other parts of the world cowries have been found with other personal objects and it is believed that the cowry not only insured life, but resurrection. At Ad Darbahaniyah, one of the mounds pinpointing the location of medieval Julfar (forerunner of Ras al Khaimah before its abandonment because of Portuguese pressure around 1633), archaeologists found a money cowry (M. moneta) believed to have been used as currency. The Director of the AlAin Museum stated the cowries were occasionally used as currency in the Gulf until late in the nineteenth century. It might also be noted that in Archaeology in the United Arab Emirates, Vol. 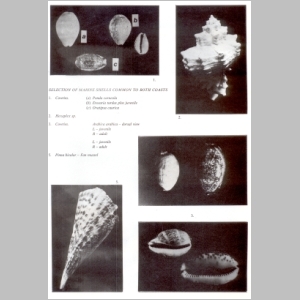 II -III, a fragment of a tiger cowry (Cypraea tigris) was reported among the objects found at Hili 8, phase F. The report identifies it as a ground fragment of the lip, but does not speculate on its possible use. Also at the Al Ain Museum, on display with surgical instruments and medicine in the Ethnographical Section, is a necklace with charms for good luckand health. 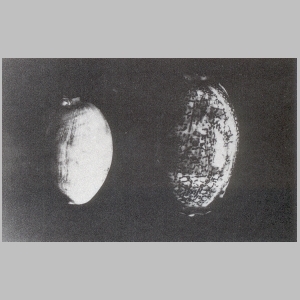 One amulet is a ringed money cowry (Ornamentaria annulus) with its top cut off. The Assistant Curator told us that the cowry was not commonly worn as a charm in this area, but this one might have been used as protection against the evil eye. In many areas of the world, cowries have been worn by women to confer fertility and to ensure healthy pregnancies, as well as protection against evil. In the present day Emirates, cowries have a very limited use as a tool in one case and as an ornament in another. An unusual example of the cowry as a tool involves the local handicraft of talli, the silver-stranded braid used as decorative trim on women's garments. The tallimaker "presses" the slightly crinkled finished product with a large cowry shell (A. arabica or C. tigris). The woman places the talli strip on the flat floor, secures one end of silver braid with her big toe, stretches out the talli and runs the cowry, aperture down, from her toe to the end of the talli. By this process the talli is straightened and smoothed and ready to be sewn on as trim. The ornamental use of cowry shells can be seen on the decorative head collars worn by the horses at Sheikh Zayed's stables. The shells are mostly ringed money cowries (O. annulus) with the tops cut off, and they are sewn onto handbraided and handwoven belt-width strips, aperture up. The shells form a variety of designs including four and six-petalled flowers and other repetitive patterns. The white shells are accented with colourful plastic buttons and beads. In addition, the head collars are heavily and richly tasselled with items imported from Syria. Of the approximately 185 species of cowry found in the warmer waters of the world, 14 have been found and recorded in the UAE on both coastlines. The following is a list of genus, species and common names, with brief descriptions of species recorded from the Emirates. Lengths given are approximate. 5 - 6 cms. Smaller than A. arabica, more ovate and humped. Dorsal line creamy white; three broad, dark underlying bands covered with rounded reticulations. Margins calloused, creamy with dark brown spots tinged with lilac. Base swollen, pink-cream with almost no spots; teeth short and fine, pale to deeper orange. Anterior blotch and spire blotch. Recorded Abu Musa Island, Arabian Gulf. 5 cms. Ovate to oblong. Pale brownish shell with bands of darker tone. Base pinkish, aperture narrow, teeth orange red. Extremities produced, depressed, with characteristic brown patches. Recorded Abu Musa Island, Arabian Gulf. 7 - 10 cms. Ovate; swollen. Bright brown spots on bluish mottled dorsum. Margins unlined. Base white, teeth large and strong. Not umbilicate. (Dubai Museum has a dark golden C. tigris, a distorted colour variation which may be due to food, water or too much mud entering the shell.) Recorded Das Island, Arabian Gulf. 2.5 - 4 cms. Deltoidal and humped. Dorsum colour flesh to yellow-brown with dark brown spots. Large brown blotch on sides above marginal rim. Base pale flesh crossed with red-brown lines and dots. Teeth coarse. Recorded Gulf of Oman. 2 - 5 cms. Flattened, deltoidal shape with dorsum. Bluish-white shell sprinkled with reddish-brown dots; towards anterior extremity dots become dashes. Margin calloused, white with chestnut dots. Base white, flattened, teeth close and numerous. Recorded and common on both coasts. 3 cms. Pear shaped. Pale creamish, profusely freckled with small brown dots; three bands of dark brown squarish blotches. Margins pinkish yellow, brown spots. Teeth small, interstices purple-brown. Spire sunken. Recorded Arabian Gulf. 1.5 cms. Ovate, depressed. Greenish-blue with brown freckles over three colour bands on dorsum. Margins and base with large black-brown spots smudged and elongated into stripes; teeth weak. Recorded Gulf of Oman. 3 -3.5 cms. Ovate, humped. Bluish-white shell with three obscure bands of wavy blotches freckled with reddish brown spots. White margins with brown spots. Base white, teeth large and distant. Recorded Arabian Gulf. 1.5 -2.5 cms. Smooth, solid, ovate shell; humped. Cream to ivory with bluish grey dorsum ringed with yellow gold. Aperture narrow, teeth coarse. Clusters on underside or rocks in shallow water. Recorded both coasts. 4.5 -5 cms. Dorsum greenish yellow flecked with brownish gold. Margins calloused and spotted. Base unspotted; aperture wide, teeth coarse and ridged across outer lip. Recorded both coasts. 1.5 cms. Cylindrical. Pale slate colour with minute freckles of olive brown; central banding or bluish orange blotch. Few margin spots, some extending over creamy base. Teeth weak. Recorded Arabian Gulf. Less than 1.5 cms. Cylindrical to pear-shaped. Bluish grey dorsum with some brown flecks. Local race tends to have interrupted central zone in place of dorsal blotch. Margins not calloused, but spotted. Base creamy white with scattered spots, teeth fine. Extremities with dark purple terminal spots. Recorded both coasts. 3 -7.5 cms. Ovate and humped. Without spots, pale flesh colour with four to five transverse bands of deeper tone. Margins and base brownish pink; teeth and interstices purple. Recorded both coasts.